I've got some tough decisions to make soon. Stay in CSP and keep adding performance parts? Or strip the car back to stock? Competing in C Stock will give me a more benign PAX factor of 0.831. C Street Prepared PAX is a more aggressive 0.856. So from the competitiveness point of view, Stock is the way to go. 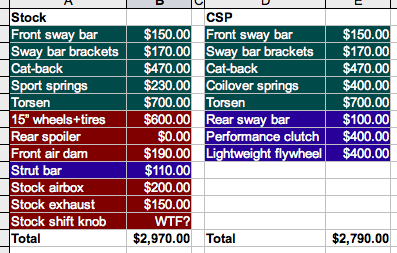 If you would kindly turn your attention to Exhibit A, the table outlining the cost (monetary as well as moral) to either converting to CS or making a real CSP car out of Bonnie. You will note the color coding. Dark-green color means that I want to perform this modification on the car regardless. Blue means, it's not on my "can't live without it" list. And you will note that red means that I would hate to perform that change. So torsen differential, front sway bar, springs, and cat-back I will have to buy no matter what. However, going stock means that I will have to get my car to conform to one of the factory packages. Sports package being the one that's most feasible in my case, I will need to swap out the cold air intake and the exhaust manifold that I have installed for OEM parts in order for it to comply with the rules. I definitely would hate to see them go. Same with the addition of the rear lip spoiler, which seems to be quite happy in my storage shed. I will also need to run 15" wheels, because they came with the Sport package, and they will need a set of Azenis, at a minimum, to be competitive. Front air dam is just for show (certainly at autocross speeds), adds weight, and costs a ton, so I am not crazy about it either. The strut bar I don't really hate, but it's a rare part and expensive, without adding much in the way of frame stiffness, hence the blue color. What I really hate is that if I wanted to be 100% legal in Stock, I will have to swap out my beloved Voodoo shift knob for stock! Now don't get me wrong, I didn't even install it, it came with the car, but I have grown to like it a lot. But what really gets me is the ridiculous requirement to swap it out. My kind reader will also note that all of this humiliation will serve to effectively wimp my car down. All for an additional 0.025 in PAX! Now to CSP. For about the same amount of money (and actually less, because the rear sway bar, the clutch and the flywheel aren't on my to-do list for Phase 1) I will get to enhance my car's performance further and have plenty of room to spare should I want any more mods. I can take my sweet time installing the upgrades, as I am in CSP already, unlike Stock, which will remain out of my reach until I am 100% done with all the changes. But! The obvious disadvantage is that of course I will have to make do with a higher PAX factor. Which means, I will have to learn to drive better. Which in turn, is not the worst outcome. At the moment, I am not sure what I will do. What do you guys think? are you kidding? would you rather love your car or win with it? also would you rather be a better driver (and win less) or worse one (and win more)? Go for the fun, and not for the points! I'm going to have to agree with the general sentiment so far. Go for the CSP - if you drop back to stock you will start to not like your car as much, and since it's closer to a hobby for you than just a car, you don't want to go there. Besides, in all honesty, winning isn't the point. Points aren't the point. Enjoying the vehicle is the point. How much fun would have winning in a Geo Metro versus placing in the middle of the pack in a Corvette, Camro, or Lotus? Yeah, that's a bit of an exaggeration, but I'm sure you get my basic point.